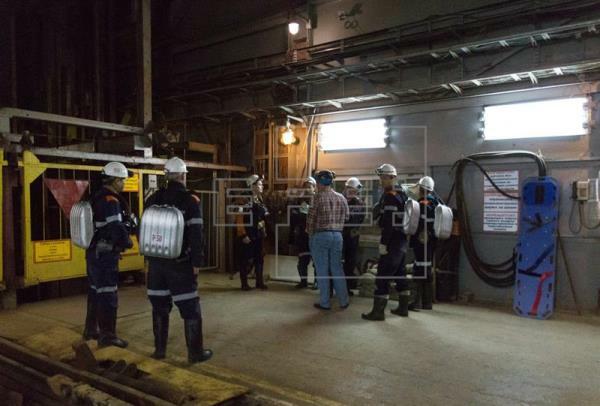 (IDEX Online) – ALROSA ended its search and rescue operation for eight missing miners at the Mir underground mine on Saturday, saying that the "danger of an uncontrolled instantaneous inrush of water into the mine shaft makes any rescue works underground impossible." On August 26, the water volume accumulated in the open pit mine was 37,400 cubic meters. The Emergency Response Center held a meeting to examine the calculations’ results and all possible options and decided that given the situation, it is impossible to carry out any work, including pumping out of water and focused explosions. The search and rescue operation at Mir underground mine continued for three weeks, working 24 hours a day in three shifts. A total of 320 people were involved in the operation: 170 specialists of the Emergencies Ministry and about 150 employees of ALROSA. The search was conducted at a depth of 550 and 600 meters, the total volume of the rock extracted amounted to 19.5 cubic meters and the length of the cleared mine workings was almost 2,000 meters. "The search became more complicated on August 18, when the water coming from the Metegero-Ichersky aquifer complex stopped discharging into the underground mine and started accumulating at the bottom of the open pit," ALROSA said in a statement. "The inflow in the open pit mine was about 1,200 cubic meters of water per hour, of which about 1,000 cubic meters discharged into the underground mine, and 200 cubic meters accumulated at the bottom of the open pit every hour. It created a danger of instantaneous breakthrough of accumulated water into the mine shaft and endangered the lives of miners and rescuers working underground. Federal norms and regulations in the sphere of industrial safety prohibit rescue operations in such conditions, so the search for the missing people was suspended at 4.00 pm on August 19. "By this time, three weeks have passed since the accident. Medical experts believe that people cannot survive for such a long time without drinking water, food, in the conditions of high humidity and in the mine flooded with a mudflow that has a high content of hydrogen sulfide and salts." ALROSA will pay to the missing miners’ relatives a compensation of RUB 2 million regardless of the outcome of the rescue operation. In addition, the miners’ relatives will receive insurance payments and payments from the budgets of various levels, including those of the Republic of Sakha (Yakutia) and the municipal entity Mirny District. The families of the workers from the Belgorod Region will also receive payments from the Administration of the Belgorod region, and the families of the miners who lived in Mirny – from the budget of the municipality of Mirny. The legal status of the miners remaining underground after the end of the search and rescue operation will be considered by the court in the near future, the firm added.